Last season I took a cursory look at the importance of depth at offensive line. I highlighted the thinness of the Redskins' line by pointing out that although their total salary spent on their line was in line with most other teams, a large part of their cap space was allocated to a single player, left tackle Trent Williams. Their median salary was less than half of that of the division leading teams at the time, suggesting that the Redskins annual mid-season swoon was due to a lack of replacement talent following inevitable injuries to starting linemen. As in my other salary analyses, I relied on cap hit as the truest measure of a player's cost to a team. NFL salary structures are notoriously complex, with base pay, bonuses, guarantees, and other factors. But cap hit comprises most if not all of those considerations, and it represents the cost to most team's most precious resource--its cap space. For each season, I adjusted all salary numbers according to the league's cap for that year to account for salary inflation. Naturally, we'd expect that the more a team spends on its OL, the better it should do on almost all aspects of offensive performance. They would, in general, tend to both run and pass better, score more, and win more than teams that spend less on their lines. We'd also expect that teams with higher median salaries for their OL will perform better than those with lower median salaries. We'd expect that salary effects on performance would show up in both overall offensive performance and in line-specific metrics, such as sacks, QB hits, and tackles for losses. 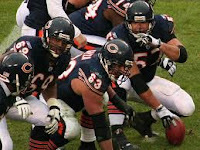 Measuring offensive line performance statistically might be the most difficult tasks of all advanced football analysis. My approach has been to measure how little damage an opposing front-7 does (counting linebackers on pass plays only when they are pass-rushing). Still, linemen are central to all aspects of offensive play, so there should be no doubt we'd see a relationship between salary and overall offensive performance. The results of the analysis were surprising. Most correlations between OL salary and performance were weak or non-significant, but there was an unmistakable pattern to the results. In general, higher total cap dollars allotted to the OL correlated with worse performance, while higher median salaries correlated with better performance. The table below lists the correlations of team total OL salary and median OL salary with all relevant performance statistics. Stats preceded with a negative sign (-EPA, for example) refer to OL EPA allowed to opposing defenders. The first thing to notice is that the correlations are all weak. I was expecting a slightly stronger relationship. For comparison, a QB's salary cap hit and EPA correlate at r=0.26 during the same period. Many are not significant at all. With the sample size here, significance is at or beyond a correlation of 0.09 (or below -0.09). Also keep in mind that there are about 40 tests in this analysis, and we should expect a couple Type I errors, meaning that we'd see significance where none actually exists. Interestingly, the basic stats in the analysis (QB hits, sacks, sack yds, and tackles for losses--each marked with an *) which don't rely on any advanced models are the most telling. Total OL salary correlates positively with these stats, which means the more teams pay their linemen, the more sacks and tackles for losses they tend to give up! But if you look at median salary, we see exactly the opposite. The correlations are all negative, meaning that a higher median salary indicates better performance. And the same pattern exists for nearly all the performance statistics. Higher median salaries correlate with better performance while total salaries correlate with poorer performance. The Diff column is nearly universally positive, except for the stats in which higher numbers are bad like sacks. And even when the correlations themselves are not significantly different from zero, the correlation for total and median are significantly different from each other. This is the pattern in stat after stat, and only two of the 22 stats analyzed, Run -WPA and Run -EPA, bucks the trend. When drawing an inference, it's this pattern, and not necessarily the strength of the correlations themselves, that I'd hang my statistical hat on. The pattern indicates that a robust offensive line corps is better than having several star linemen interspersed and backed-up by bottom tier linemen. In other words, on a player scale of 1-10, it's better to have a line of all 6s rather than a line composed of 10s and 2s. The nature of offensive line play might dictate that lines with the fewest weak players are better than lines with the most strong players. Line play is a parallel process, akin to a chain which is only as strong as its weakest link. The weakness of most of the correlations shouldn't be too surprising after all. Salary cap hit, although the best among the available options, is still an imperfect measure of the price of a player. And salary is an imperfect representation for actual ability. Veteran free agents are pricier than equivalently performing players serving under their rookie contract. Throw in the unpredictability of injuries, opponent strength, and the randomness of the sport itself, and it's easy to understand why the correlations are weak. Perhaps most importantly, the fact that, due to the salary cap, teams tend to spend about the same total amount on their offensive lines means there isn't going to be a lot of leverage on marginal dollars spent on linemen. That's why how a line is built appears more important than how much is spent building it. Regardless of the reason, there is a lot of variance in team offensive performance unaccounted for by OL salary. This analysis is far from conclusive, and as always, further research is warranted. For example, what if we only look at each team's top 5 OL salaries and ignore reserves? What if we only look at the back-ups? Or account for players under their rookie contracts? There are also better ways of looking at the allocation of salary along the line (I'm thinking Gini coefficient maybe?). Brian, maybe you should look at the fact that teams with elite QBs can't afford expensive OLs and have to rely on 6s and 7s. Are you measuring the timing of sacks? I believe there is evidence that after 3 seconds, the OL is no longer responsible for a sack/pressure. Also, with sacks, are you measuring the player responsible for it..ie TE or RB? I would be interested to see if there is any impact on the analysis if you use cap hit *minus that player's veteran minimum*. In other words, if a guard this year has 10 years of service and he's making $925,000 and the other guard is a rookie who is making $390,000, they are BOTH making the league minimum, given their total number of seasons played. Now I understand that if the 10-year vet is taking 3x the cap space, then maybe he should still be expected to perform at 3x the level of the rookie. But I believe that in practice, the end result is usually that the 10-year vet and the rookie play close to the same level (if the 10-year vet was truly a superior player, he would get some kind of bonus, above and beyond the league minimum). Often the 10-year vets are kept on the roster merely because the team can't find a serviceable rookie or street free agent who can even play at the lowest of league standards, so they choose to eat the extra salary of the veteran, even though the veteran is somewhat overpaid with regard to his talent level. iwatt--Completely agree. Teams with $20M QBs don't have much left to spend on the OL. And those $20M QBs are probably impacting offensive performance much more tangibly than the line. You'd lose degrees of freedom, but you might consider dummies for the round (or group of rounds: 1, 2-3, 4-7) in which a guy on his rookie contract was drafted. A line with a bunch of first rounders, for example, would be expected to outperform its salary measures by a wide margin. Brian, I don't mean to demean your work, but your analysis shows exactly what I'd expect. From everything I've ever read about O-line play, your chain cliche is right on. The other thing I've always read is that cohesiveness and teamwork amongst the O-line is more important than the talent of the linemen. This is esp. seen in pass blocking with regard to stunts and blitzes, esp. zone/overload blitzes. Basically, every lineman can only block one guy, so everybody needs to know who is blocking whom, so that two guys don't end up blocking one guy while another comes free. IMO, this can be magnified (in either direction) by a QB who is great/poor at pre-snap reads; by a QB with a great/poor "pocket presence"; or by a scrambling QB. For two opposites, think the PM Colts [great at pass blocking, poor at run-blocking, at least in the last couple of years] and last year's Broncos [great run #'s, poor pass #'s]. In my two examples, the QB had more to do with the numbers than the O-line. Teams like this will pollute any trends that might exist in the NFL in general, and there are enough of them to probably ruin any good study. I wonder if this effect is similar to the curse of the highly-paid RB. One part spending too much money relative to the importance of the position, one part it takes multiple players to fill the role. It would be interesting to build some type of value model for linemen that factors in the opportunity costs of adding a big money player vs. several lesser, yet solid, players. As someone mentioned the marginal value added by a single stud player is reduced by the lost marginal value of his linemates. I guess this would be similar to modeling the weakest link, but not in an absolute sense. What about looking at a defense's results in each game of a season versus the opponent's OL median/total cap? Wouldn't you need to negate the influence of other factors (elite QBs for instance) in order for your statistics to be meaningful? Shouldn't your data be interpreted as showing that the stats you are using do not effectively measure OL play? Or perhaps that coaches do a good job of coaching around OL weaknesses. If your left tackle stands a good chance of being beat, then the coach revises his playbook and maybe the left tackle looks ok statistically. But if your QB just isn't very accurate, there is no easy way to coach around that problem. Anon-The idea is that with a data set large enough, you'll have OLs with good QBs and OLs with bad QBs and everywhere in between. Good coaches and bad coaches, etc. It would be better if we had a model that accounted for how good a QB or coach is, but it's impossible to parse apart a QB's performance from that from his line. But in the aggregate, the effect of QBs will (tend to) average out. Brian, good stuff as always. You end with the hypothesis that low variance in O-line pay is good, but you don't test that claim. Can you do a quick comparison between offensive performance and O-line pay variance? Or better yet, Gini coefficient? 1. It'd be nice if you could figure out how to control for the tendency of a QB to get sacked more often due to how he plays vs. due to OL performance. You can see on PFR how Peyton Manning has the 2nd lowest sack rate of all time. If you watch a Peyton Manning pass play, it's quite obvious that the low sack rate has less to do with the line & more to do with how quickly Peyton identifies a target & releases the football. There's an apparent correlation between scrambling QB's (see Roethlisberger, Vick, Rodgers, McNabb) sack rate & pocket QBs (see Marino, Manning Brees). 2. I second the idea of testing salary vs. Pro Football Focus grades. It would eliminate a lot of noise, since they watch EVERY play in determining their grades. For example, to determine responsibility for a sack. I've even heard that some linemen will contact them when a correction needs to be made (i.e. an explanation that a sack should not be attributable to them given the OL's respective assignments on the play). I find this interesting in that the strategy for the offensive line appears to be the exact opposite of how to build a winning NBA team. The recipe in the NBA (under the current collective bargaining agreement) seems to be to have a few stars with the max salary and a bunch of low-paid young guys and role players. It truly is the weakest link theory for the OL. Erik--That is interesting. In basketball, the 5 guys on the floor aren't used equally. The offense has the initiative and can choose who has the ball and takes the shot. You can hide your weaker players relatively easily, as long as they are functional defenders. For NFL OLs, you can't hide your weaker players. They have approximately equal impacts on every snap. I would love to see a study on the effects of continuity on offensive line play. I am always reading articles referencing the importance of continuity ("All 5 linemen started all 16 games last year") with the assumption that continuity is much more important on the OL than other units. This makes intuitive sense, but then again it could also be attributed to survivor bias. That's because it's more important for linemen to be "on the same page" (as well as anyone else blocking, like the FB). If one guy doesn't do his job, there is a reasonable possibility that the play will not result in a positive gain. For a counter-example, if one of the 4 WR/TE's run a wrong pattern, there is still a chance that one of the others gets open, and the play will gain positive yardage. While we can all give examples of a WR/TE missing the "hot-route" signal and the QB throwing it right to a defender, the linemen must block together on 60-70 plays per game, while the hot routes will be run on 10-15. Joseph, I agree that good teamwork (AKA "chemistry" or "being on the same page" as you said) is important to an offensive line, but I am somewhat skeptical of the conventional wisdom that continuity leads to good chemistry. My question is: Can a team improve its offensive line simply by keeping the same players in the starting lineup year after year? If this were the case, teams could get a lot more for their money by re-signing their mediocre veterans rather than replacing them with high-paid free agents or high draft picks who might take years to develop chemistry with their teammates. I can think of a few teams that seem to buy into this concept. For example, the Lions have kept Jeff Backus and Dominic Raiola in the starting lineup for the last 10+ years despite their apparently mediocre performance for much of that time. It's an interesting question you're posing brett. I'm not sure I completely follow what this article is suggesting though. Is the median offensive line what the average cap hit between the teams that spend the 16th + 17th most money on their line and total OL salary is the highest spending team? Or are these individual statistics? I know nothing of advanced OL stats to be totally honest. And if so, are we sure that the expensive offensive lines aren't just mismanaged and over allocating resources on a guy or two instead of seven? or is that what your arguing with this article? And if so, this application to wide receivers would be awesome, as I'm suspicious free agents and fan favorites are probably over compensated for the part they play in a successful passing offense, which in my opinion, isn't as significant as, obviously, the quarterback but also the limiting of pressure on the quarterback.